Free the imagination with the vibrant musicality of Aria. The sleek, compact 9 note instrument is thoughtfully crafted with a slightly curve surface area featuring open anodized aluminum keys and simple non-resonating aluminum frame. The unique design helps reduce the vibration through the frame while allowing the notes to produce low yet delightfully enticing sounds. 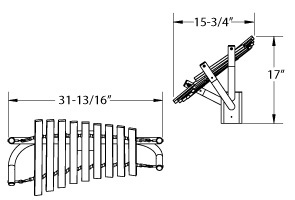 Ensembles instruments are specifically configured for in-ground or surface mount installation, the recycled plastic and steel post mounts are factory cut for Adult or Toddler 'Finish Height'. The in-ground mount posts are ready for subgrade installations with 36" length for 'Frost Depth'. Actual Post Length = Finish Height + Frost Depth. Recycled plastic post can be easily cut to custom height in the field. 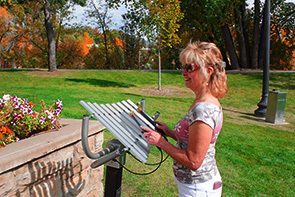 Aria provides all ages, skill sets and abilities an easy to use, durable all-weather instrument that is never out of tune and complements playgrounds, parks, gardens and more.